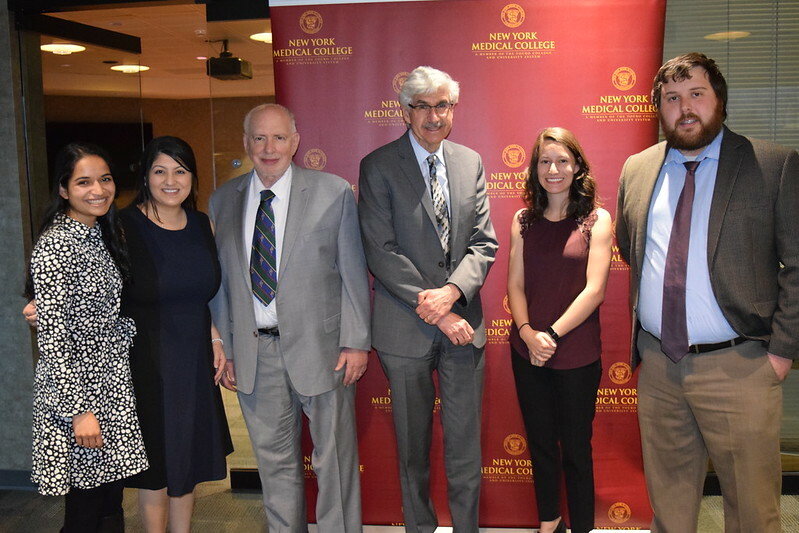 The New York Iota chapter of Alpha Omega Alpha (AOA), the national medical honor society, welcomed Elliot Levine, M.D, as the Annual AOA Visiting Professor on April 2. Dr. Levine, who is instructor of medicine and a physician at the Advanced Heart Failure and Cardiac Transplantation Center of the Westchester Medical Center Health Network, specializes in advanced heart failure, transplant cardiology, clinical electrophysiology and nuclear cardiology. He presented “If I Only Had a Heart,” covering the history of heart transplantation and mechanical circulatory support. Following Dr. Levine’s lecture, a dinner and ceremony were held to induct medical students from the Classes of 2019 and 2020 as well as faculty, residents and alumni into AOA. Iota Chapter Councilor William H. Frishman, M.D., third from left, the Barbara and William Rosenthal Professor and Chairman of the Department of Medicine, professor of pharmacology, and the only AOA councilor who has served in two different medical schools and chapters—Albert Einstein College of Medicine at Yeshiva University and New York Medical College—welcomed guests of the evening. Dr. Frishman’s 41-year tenure as councilor is the longest in AOA’s history. Photo: Members of the School of Medicine Class of 2019 and New York Iota chapter officers from left, Ariel Kwart, academic coordinator; Ami J. Trivedi, vice president; Caitlin Lozano, president; and Adele Shenoy, volunteer coordinator, were joined by Iota Chapter Councilor William H. Frishman, M.D., third from left, the Barbara and William Rosenthal Professor and Chairman of the Department of Medicine, professor of pharmacology; and Jerry L. Nadler, M.D., MACP, FAHA, FACE, third from right, dean of the School of Medicine.